Search Results for "young students classroom"
4k, Overworked and bored young student sitting in classroom. Slow motion. 4K Young students entering school classroom before a lesson. Young female students listen carefully during classroom lecture. 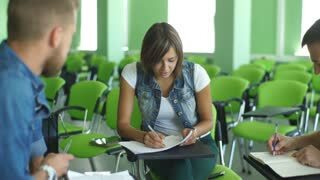 Close up view of woman attending class and taking notes. Students seated at a long curving table in a large classroom. Hispanic Young Man Among His Fellow Students in the Classroom. Young Bright People Listening to a Lecture and Take Notes while Studying at the University. Shot on RED EPIC-W 8K Helium Cinema Camera. 4k, Young students in a classroom on a digital tablet. Slow motion. 4k, young students writing in a classroom. 4K Teacher watching over young students working in school classroom. UNITED STATES 1950s: Students doing various activities around the classroom, young boy presents a frog to some girl students. 4k, closeup shot of young students writing in a classroom. 1950s: Young man sits in front of a desk, takes notes with pencil. Text with title ?Understanding what you read?. Male students read in classroom. Young man reads in library and smiles. 1970s: View of dinosaur skeleton. Students in classroom watch man who is holding a snake. Young students and adult crowd around glass display case and look at snake. Russia, Novosibirsk, 2018. Young students sit on lectures in the classroom amphitheater, lecture theater. Students at a lecture at the university in a large lecture hall. 1940s: Young woman speaks. Students sit in classroom. Teacher stands in back of room. Hispanic Man Uses Smartphone While Being on a Lecture in the Classroom. Young Bright Students Study in University. Shot on RED EPIC-W 8K Helium Cinema Camera.